Slots Of Fortune Casino is no longer available . Click here for alternative casinos . 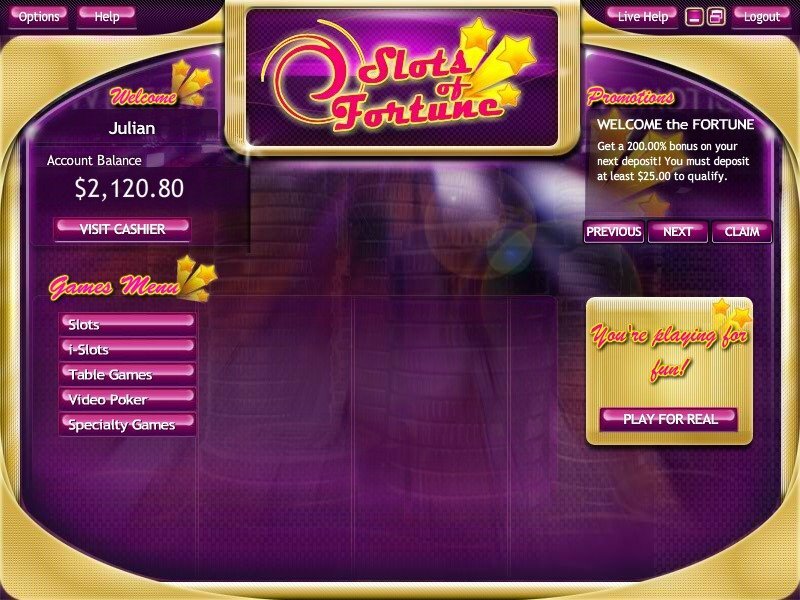 Slots of Fortune is a new breakthrough in an industry with many similar casinos and software competing with each other. While the gaming experience at Slots of Fortune still isn’t up to par with some of its veteran rivals, they have certainly found their own unique niche in the market with engaging i-Slots and a young and growing software company. The future looks promising for this one. There’s a new casino on the market! I always love playing at a casino I’ve never known before. It’s a bit like watching a new movie at the theater or hearing that new hit song from that artist that you love the most. In this case the new song is a bit of a let-down, but there’s lots of room and potential for growth and change. This Slots of Fortune review will show you that although quality isn’t yet of the highest standard in gaming, this is a casino worth watching out for. Slots of Fortune online casino runs on the relatively young software from Rival Gaming. This is a software company that has been dedicated to smoothness, flexibility and quality from the beginning. Graphics and programming quality still aren’t good enough to rival their top rivals, but they accept American customers to whom the offer a refreshing alternative from the widely used Real Time Gaming software. Slots of Fortune offers the high quality Rival Gaming versions of all classic casino games like Black Jack and Video Poker, but their biggest selling point by far is the line of unique i-Slots that drag you in and keep you playing for hours with creative themes and interactive story lines. It’s like going on a great gambling adventure. While most Americans will be used to visa deposits and painfully slow withdrawals, they’ll be thrilled to see Click and Buy as one of the payment options at Slots of Fortune, finally giving an American the option of instantly transacting with his casino. Another great thing to see at Slots of Fortune is that the release of every slot is an improvement from the old ones. Rival Gaming seems determined to catch up to their competition quickly and Slots of Fortune is sure to benefit from this dedication in the future. 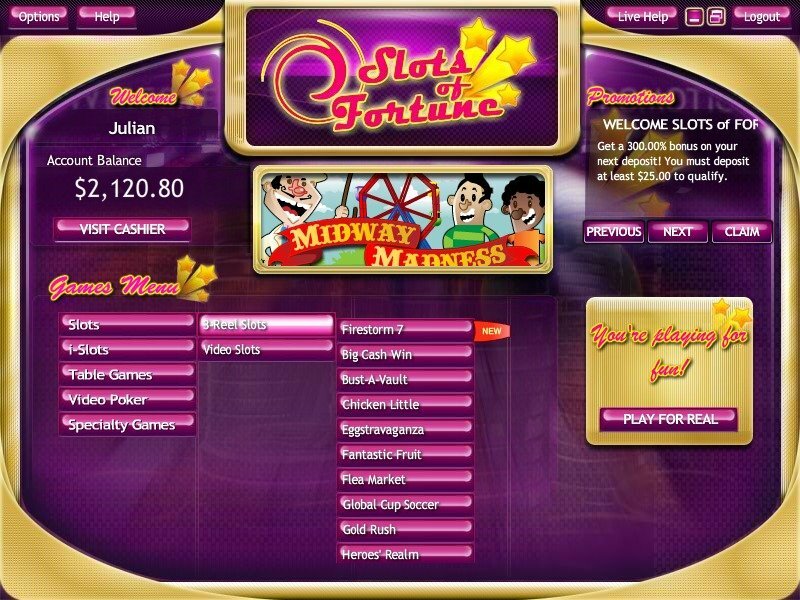 Slots of Fortune proudly announces on their site that they, “provide the best selection of bonus offers anywhere online.” As it’s my job to know these things I can tell you that this all depends on your point of view. While I’ve played at many casinos with a much larger variety of bonus and promotion options, the amounts being offered at the time of this Slots of Fortune review are quite generous. You’ll certainly find plenty of ammunition for the slots as a new player and you can eventually get the royal treatment with a well planned out VIP program. This new casino is also attempting to make ripples in the industry by entering market with great payment options available. While most Americans will be used to visa deposits and painfully slow withdrawals, they’ll be thrilled to see Click and Buy as one of the payment options at Slots of Fortune, finally giving an American the option of instantly transacting with his casino. Support at Slots of Fortune is also of acceptable quality, though accessing the instant chat is not quite as obvious and inviting as I appreciate it. Representatives are available however 24/7 and I see no reason why they should not be utilized.